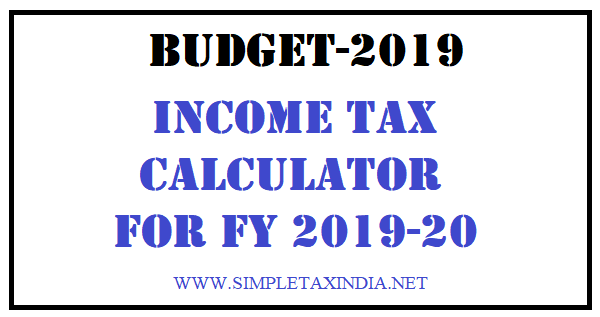 Interim Budget 2019-2020 Speech has been delivered by Piyush Goyal , Minister of Finance on February 1, 2019. Though no changes has been made in made in tax slabs , yet a rebate of maximum amount of Rs 12500 has been allowed to persons having taxable income up to Rs 500000/-. So if your taxable income is more than Rs 500000 than no rebate is available to you under this clause and your tax liability remains as it is. Further amendment has been proposed in section 16 of the Income-tax Act to provide relief to the salaried taxpayers by way of increasing the amount of deduction from salary income, from existing forty thousand rupees to fifty thousand rupees. Further amendment has been proposed 194A of the Income-tax Act so as to ease the burden of compliance by way of increasing the threshold limit from ten thousand rupees to forty thousand rupees, for deduction of tax at source on interest income, other than interest on securities, paid by a banking company, co-operative society or a post office. Further amendment has been proposed section 194-I of the Income-tax Act to rationalise the threshold limit from one hundred and eighty thousand rupees to two hundred and forty thousand rupees, for deduction of tax at source on rental income .